As the only child of Sir Edward Stanhope and Elizabeth Bourchier, Anne Stanhope became the sole heiress of her father’s estate at the age of one. Through her mother’s side of the family Anne was descended from King Edward III of England through his son, Thomas of Woodstock. 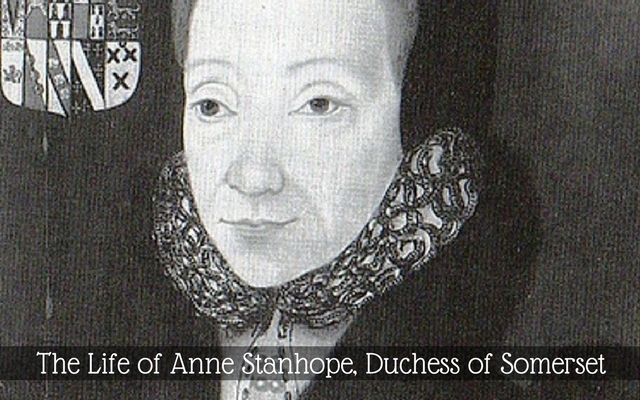 After the death of Edward Stanhope, Anne’s mother eventually married again, her third marriage was to Sir Richard Paget, who was also well-connected to King Henry VIII. Paget was a gentleman of the Privy Chamber for King Henry and also Vice-Chamberlain in the household of Henry Fitzroy. There is little evidence that remains about Anne’s childhood – it is, however, believed that she was a maid-of-honor to Katherine of Aragon. It is believed that Anne Stanhope met her future husband, Edward Seymour while they were both in service at court in 1529¹ – Edward was in the household of Henry VIII while Anne was in service of Queen Katherine. At that time Edward was still married to his first wife, Katherine Fillol and the couple had just had their second son, Edward. Or what was believed at the time to be his son. As the story goes, it was discovered sometime between 1527 and 1530 that Edward’s wife Katherine Fillol had an affair. The scandalous part is that it was a long affair with…yep, Edward’s father, Sir John Seymour. When Edward discovered the affair he was outraged, as any spouse would be after such a discovery, but he was enraged by the fact that the culprit was his own father. After discovering what happened, Edward immediately sent his wife to a nunnery. While not knowing for certain the paternity of his sons, he disowned both of them — after all, how would he know if the boys were his sons, or brothers? How could he look at them without wondering? There is no definitive proof that Edward’s father, Sir John Seymour was indeed the man who Katherine Fillol had an affair with, but many historians believe so, including Alison Weir. However, in Weir’s book, “The Six Wives of Henry VIII” she states that all of Henry’s court was aware of what had happened with the Seymours. That statement, if true, leaves me wondering why Henry VIII would look at marrying a woman from a family with such a scandal. It is possible that a lot of people knew about it. It is definitely possible that they talked about it. A handwritten note is recorded in the margin of Vincent’s Baronagein the College of Arms: “repudiata quia pater ejus post nuptias eam cognovit.” Roughly translated, it says, “Divorced because she was known by his father after the wedding.” It alleges that the affair Katherine was having was with her own father-in-law, Sir John Seymour. One story given by Peter Heylyn states that when the Earl, then Sir Edward Seymour, was in France, he ‘did there acquaint himself with a learned man, supposed to have great skill in magick; of whom he obtained by great reward and importunities, to let him see, by the help of some magical perspective, in what estate all his relation stood at home. In which impertinent curiosity he was so far satisfied as to behold a gentleman of his acquaintance in a more familiar posture with his wife than was agreeable to honor of either party. To which diabolical illusion, he is said to have given so much credit that he did not only estrange himself from her society at his coming home, but furnished his next wife with an excellent opportunity for pressing him to disinheriting of his former children. Something happened during her marriage to Edward. In her father’s will, dated 1527, Catherine is excluded from inheriting “for many dyverse causes and considerations … Catherine nor hir heiress of hir boody ne Sir Edward Seymour hir husbonde in any wyse have any part or parcell’ of his manors or estates. Instead, Catherine is left an annual pension from the estate of 40£, provided she go and “virtuously and abide in some house of religion of women.” In other words, a convent. Edward Seymour and Anne Stanhope were eventually married sometime before the 9th March 1535 and their first child, Jane (presumably named for the queen) was born on the same day Prince Edward, 12th of October 1537. Unfortunately, as was common for the time, little Jane did not survive. In 1538, a son named Henry (after the king, of course) was born but soon died as well. Their third child, a son called Edward (after his father) was born in 1539. Next, author Margaret Scard in “Edward Seymour” states that a son and a daughter were born in 1540, Margaret and Henry (presumably twins). The following year, in 1541, a daughter named Jane was born. The last of the children were Mary, Catherine, another Edward and Elizabeth. Anne Stanhope was forty years old when she had their last child, Elizabeth. Anne was acquainted with, if not friends with Anne Askew in 1546 – they shared the same reformist beliefs but the difference was that one of the women was willing to died for her beliefs and to protect those close to her. On the 16th of July 1546, Anne Askew was brought into Smithfield on a chair due to the fact that she was unable to walk or stand after her interrogation by Thomas Wriothesley and Richard Rich. It is possible, and some have said, Stanhope sent a man in a blue coat with 10 shilling to help her². Some have said that Stanhope was responsible for gunpowder being placed on Askew’s body to quicken her death. During Kateryn Parr’s tenure as Queen Consort, Anne Stanhope managed to stay on good terms with both Princess Mary and Parr, but her religious leanings were Protestant. Even with that being said, Anne had a great relationship with Mary when she was Queen of England. At the end of January 1547, Anne Stanhope’s life changed for the better. Previously, Anne had been in the household of Kateryn Parr, but now Parr was a dowager queen and Anne became Duchess of Somerset and the wife of the Lord Protector – essentially she was the most powerful women in England. This quick rise in social standing may have gotten to her head when she believed that the queens jewels belonged to her and not Kateryn Parr. Parr merely wanted the jewels given back to her that were gifts from Henry VIII and her mother. The topic of the queen’s jewels may be one of the topics that drove a wedge between Edward and Thomas Seymour. Whether or not Somerset had the right to possess and control the jewels that belonged to the king or were given by the former king – this is something that came back to haunt him later. Anne Stanhope believed that Kateryn Parr forfeited her rights of precedence when she married the younger brother of her husband. Fortunately for Anne this feud would only last about a year – Parr died in September 1548 after giving birth to a daughter named Mary. After the execution of Thomas Seymour, Anne’s brother-in-law in March 1547, his daughter by Kateryn Parr lived for a brief time at Syon House under the protection of Anne and her husband before being transferred to the household of Katherine Willoughby, Duchess of Suffolk. In October 1549, Somerset was removed from power and held in the Tower of London. In an effort at reconciliation, Anne and the earl of Warwick’s wife, Jane Guildford, arranged a marriage between Anne’s daughter, Anne Seymour, and Warwick’s eldest son, John Dudley, who became earl of Warwick when his father was elevated in the peerage to duke of Northumberland. Somerset was arrested again on October 16, 1551 and accused of plotting against Northumberland. This time he was executed. Anne was also arrested and remained a prisoner in the Tower of London until May 30, 1553, even though she was never charged with any crime. Under Mary Tudor, three of Anne’s daughters were at court. Her oldest son, Edward, was restored in blood. Anne was granted a number of Northumberland’s confiscated properties and Hanworth, Middlesex, where she chose to live. It was at Hanworth that a romance secretly blossomed between Anne’s son Edward and Lady Catherine Grey, younger sister of Lady Jane Grey. When the couple eloped in 1560 and were subsequently confined in the Tower of London, Anne was careful to distance herself from them. The year after her son was sent to the Tower Anne married her late husband’s former steward, Francis Newdigate. Little is known about their life together. When Anne’s son Edward was released from the Tower of London he was released into her custody as well as his eldest son with Catherine Grey. On the 16th of April 1587 Anne Stanhope, Duchess of Somerset died, she was about 77 years old. Anne was a reformer and a literary patron. She died at Hanworth Place and was buried at Westminster Abbey. Recumbent Effigy of Anne Seymour, Duchess of Somerset. Credit: “Plate 191: Recumbent Effigies. Francis, Duchess of Suffolk, Margaret, Countess of Lennox, Anne, Duchess of Somerset,” in An Inventory of the Historical Monuments in London, Volume 1, Westminster Abbey, (London: His Majesty’s Stationery Office, 1924), 191. British History Online, accessed April 11, 2018, http://www.british-history.ac.uk/rchme/london/vol1/plate-191.